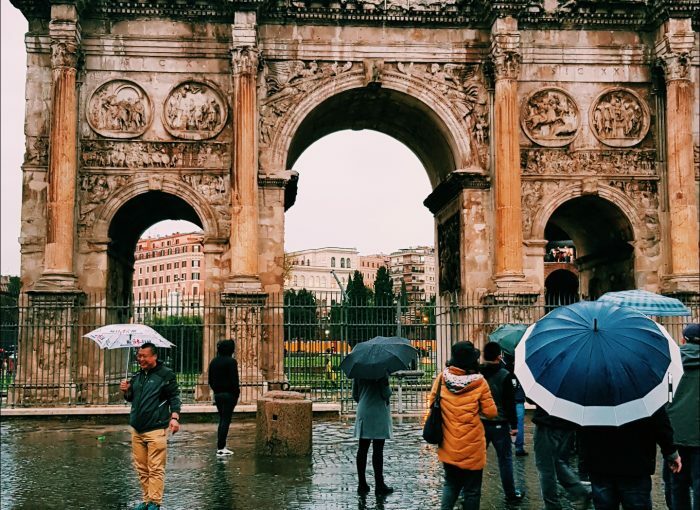 The kid’s nursery rhyme sounded in my head as I walked along the cobbled, slippery streets of Ancient Rome, broken umbrella and wet feet. The heavens could not have planned a better welcome through this downpour. This is not the vision I had of myself living my best life in one of my bucket list cities. 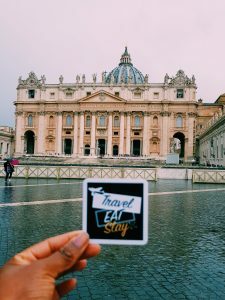 Rewind to the beginning, in true #TravelTuesday style I boarded my no frills 6:25am flight to the Italian capital –destination Rome. Thanks to Ryanair I managed to bag a 1 night stay for £30 too bad about the 3am wake up call though. Two hours later, I was out of the plane through passport control and out of the airport all in 10 minutes. This is an all time record in all my travel experiences- kudos to you Rome Ciampino airport. Exiting the airport doors with my Citymapper app loaded, I boarded the Metro A bus (on Bay 6) heading to Roma Anagnina. Ideally located right outside the exit gates, you will see the local buses that take you all over Rome. The bus ride lasted 10 minutes and dropped me off at the Anagnina metro station; metro line A will get you to most city attractions. Save the 30€ 24 hour hop on-hop off sightseeing bus fare and stretch your legs with a walking tour. Alternatively, travelling with the Metro is inexpensive- for 1.50€ you get a metro ticket that lasts 100 minutes. 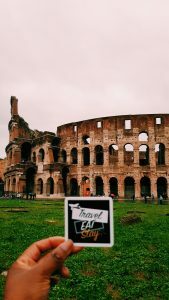 Prior to my trip I had not mapped out the sights I wanted to see, but with a little inspiration from Instagram and a simple “what to see in Rome” Google search I opted to check out the popular sights and leave a little room for spontaneity. 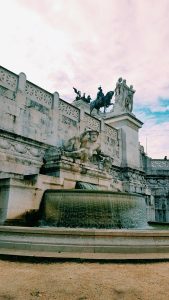 1st stop Ottaviano-S. Pietro station, past the annoying “skip the queue” tour sales people and beggars you will arrive at the breathtaking grand vast space that is St Peter’s Square. Amazing panoramic views and a few selfies later, I headed back to the metro station heading to Vittorio Emanuele. Feast your eyes on this grotesque white marble monument, a tribute to Victor Emmanuele king of Italy. 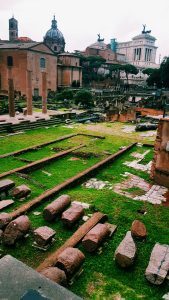 A few steps past this you will come across an open air museum and step back into time at the ruins of Roman Forum. The ultimate fridge magnet monument in Rome, though I did not get the guided tour tickets-walking around the outside of the Colosseum you can feel the magnitude and take in the beauty of this monument. The downpour escalated to thunderstorms and lightening which lead me to seek shelter back at my hostel- what a deal breaker. Day 2 kicked off early, I checked out of the hostel and headed to the metro to Piazza Spagna. 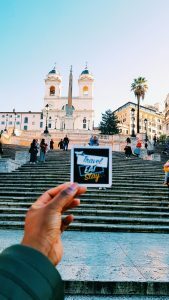 Standing at the top of the Spanish steps admiring the views of the city, walking down the 138- steps staircase and watching the sunrise was magical. The ritual of throwing coins at Trevi Fountain coupled with the myth that “the first coin guarantees your return to Rome, the second will ensure a new romance, and the third will ensure marriage” was unknown to me prior to coming here, so it goes without saying that I did not part take in the superstitions. 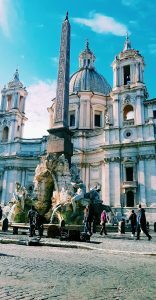 Nearby, spend a lazy day people watching, being entertained by the performing artist or simply join the tourists busking in the plaza- at what is described as Rome’s most celebrated and charming squares Piazza Navona. 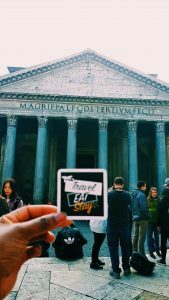 The city tour ended at the Pantheon, I must admit the dark massive marble columned temple gave off an eerie feeling from the outside and stopped me dead in my tracks from entering inside. 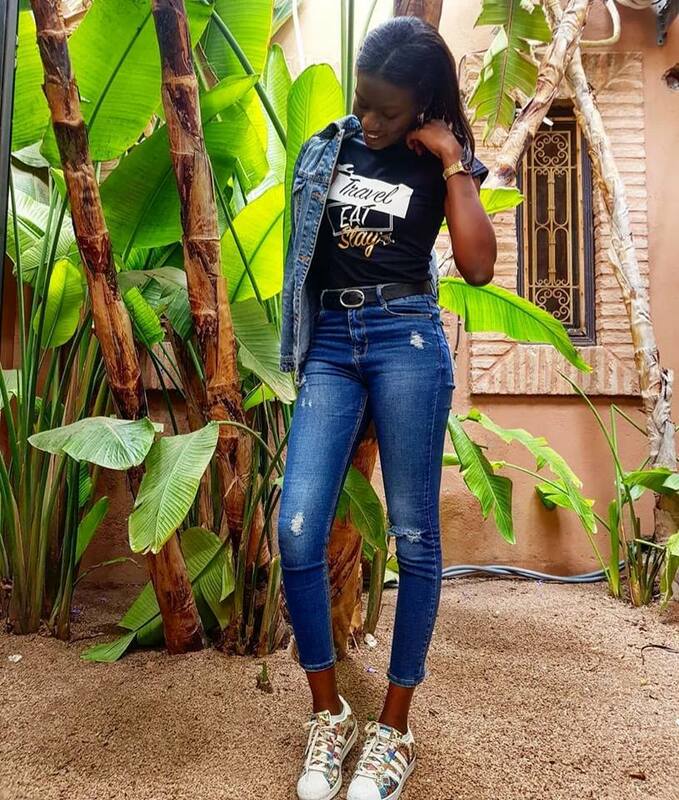 I survived my first experience of sleeping with strangers unlike my previous misconceptions of bunk beds, sleeping on a dirty mattress, being robbed or falling victim to a horror movie, my hostel experience at Des Artistes Hostel was short lived but pleasant. Costing £15 per night found via Booking.com the mixed dormitory was tucked away on a small street from Castro Pretorio metro station and ideally positioned to get to the tourist sites. From the outside the hostel could be mistaken for a boutique hotel, walking into the small reception space I was greeted by the receptionist and checked into my room located on the 2nd floor of a 5 storey building. My nerves eased up opening the door to a clean but basic room with 4 single beds, a TV, desk and wardrobe with hangers and extra blankets. My roomies were a boy from different parts of Italy, both friendly and young travellers. A few streets away from my hostel was Bramble Bar which came as a referral from the hostel along with a coupon for a free glass of Prosceco. I ordered the seafood linguine and a Havana libre cocktail. The service from the staff was welcoming, the red cushioned seats and brick walls added to the relaxed ambience of restaurant. The only non authentic thing was the 80’s classic English music playing from the speakers, other than this I would highly recommend visiting when you are in the area. 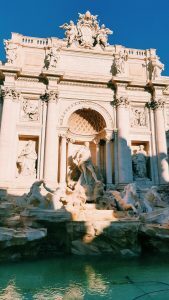 Having seen most of these sights on TV, the first hand experience was truly breathtaking and I would recommend a trip to Rome for anyone who has not been. Though the history is fascinating and sometimes seems unbelievable at some point I was tired of seeing yet another piazza or skylines dominated with dome churches. Like most tourist destinations, be prepared to say NO to aggressive street vendors wanting to sell you anything from selfie sticks, to sunglasses and handmade jewellery. Will I return to Rome? Only time will tell! !